The underground railway system in the Thai capital, Bangkok, is to remain closed for a week after 200 people were injured in a train collision. 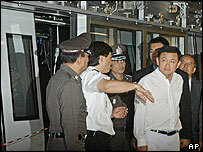 Prime Minister Thaksin Shinawatra blamed the accident on human error. Foreign safety experts are to be called in to review the network, which is only five months old. The accident occurred when an empty train collided with another carrying about 700 people at the Thai Cultural Centre station on Monday. About 24 people were seriously hurt - including the driver of one of the trains, who had to be extricated from his cabin by rescue workers. The injuries ranged from broken bones to internal bleeding, said hospital staff, quoted by the Associated Press news agency. Praphat Jongsanguan, head of operator of the underground system, told reporters: "Procedures were not followed and that is what caused the accident." He said workers lost control of a train being taken out of service after disabling an automatic braking system. The train then slid down the track and collided with the other train, he added. Lights in the parked train at the Thai Cultural Centre station went out as passengers were tossed about and trapped for 10 minutes, while staff struggled to find the keys to open the locked carriage doors. Thai Transport Minister Suriya Jungrungreangkit said the operator, Bangkok Metro, would be held responsible. The cost of the damage is estimated at about $2.6m. The underground system has a single line and serves 21 stations. It opened last August as part of efforts to relieve Bangkok's notorious traffic problems.